In my camera bag, there is, of course, the usual things you’d expect, camera, lens, batteries, filters etc etc etc. There is also two pouches that I always keep with me if I swap bags these two pouches come with me and you should have them as well. 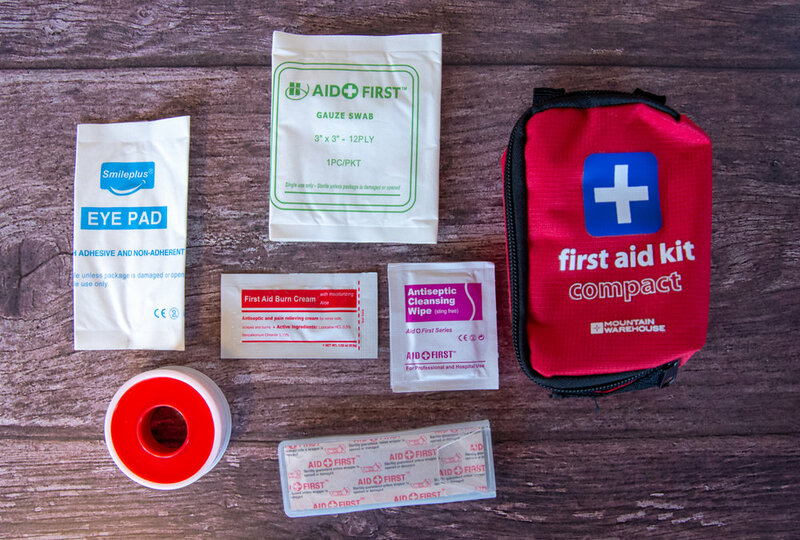 These two pouches are firstly my compact 1st Aid Kit, containing what you’d expect, plasters, wipes, scissors and so on. All in a compact kit that sits it my camera bag. You never know what might happen on a shoot or out hiking. You may never need to use it which is awesome but if you need it and don’t have it how annoyed are you going to be? The second one is my photography emergency pouch. This pouch hopefully has things in it that can save a shoot, not just for you put possibly for another photographer. Being prepared might just help you stick in someone's mind. Oh who was that guy that was super prepared, he had those spare batteries for a flash, or who had cable ties to keep that backdrop from falling down? I’d rather be known as that person than the one who turned up with a camera and lens and underprepared. Now to go through the items in this PEP. All of these items are pretty easy to come by and there’s nothing out of the ordinary. All of these items I have in bulk so that before I repack my bag and one is missing it can easily be replaced. Black Sharpie - These are everything, you should always have a sharpie. Everyday you should be using one. Torch - A little torch, it has multiple uses. Want to create lens flare for a portrait, bingo. Or out later and can’t find something in the bottom of your bag. Hand Warmer - I get cold hands and I prefer not to wear gloves. This a great, and can be used a few times before you need to replace them. They don’t need to be heated in a microwave to work…it’s magic. Super Glue - These ones are single use tubes. How many times does something break and you need a dab of glue? They’re so small and take up no room it makes sense just to have them. Cable Ties - You can mount anything using cable ties. Keep those lighting cables tidy, or attach a backdrop to a pole. They are really strong and I’m forever using them. Hand Sanitiser - Sorry but I have a fear of unwashed hands. Meeting people all day, swapping equipment, shaking hands. Chances are someone hasn’t washed their hands lately. 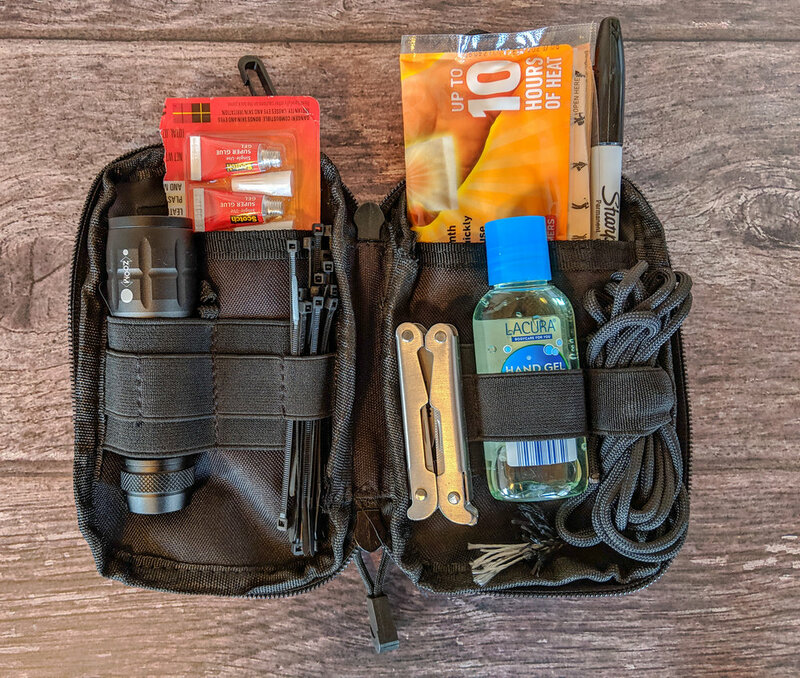 Multi-Tool - The most used item in this pouch. It covers everything, screwdriver, bottle opener, pliers. Trust me there has been an occasion when you’ve needed one of these things. It can also be handy if a filter gets stuck on a lens. Paracord - Needing to tie something to your camera bag, or hang something from a grid whilst shooting. It’s not essential in the pouch but I like to be prepared. £20 Cash - Stuck somewhere, desperate for food. Cash is key, with £20 you can get out of most situations. A taxi to the nearest town. Always handy to keep some for an emergency. Gaffe Tape - A photographer must have item. Marking spots on the floor, fixing rips in a jacket, trousers. Attaching a cable to a tripod, covering leads across a floor…honestly the list is endless. Batteries - A selection of common sizes, AAA & AA. Spares for the torch and things like mics, flashes use batteries so rather than being caught with no power at least you can switch to fresh batteries and carry on. That is My Photography Emergency Pouch, do you have something similar?